Five is an odd number. Even odder in some ways, perhaps, is the 2016 Rock and Roll Hall of Fame class: Cheap Trick, Chicago, Deep Purple, Steve Miller, and N.W.A. Look, justice is being served in some quarters here. Most definitely with Deep Purple, Cheap Trick, and Chicago: all forever-snubbed, still-touring artists that deserve at place at Cleveland's table. 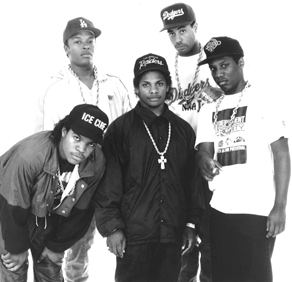 N.W.A., the only inductee to form after the 70s, is the welcome wild card. This transgressive yet sociopolitically significant Compton rap group took no prisoners, gave no fucks, and exposed an American reality too many were ignorant of, to funky, multiplatinum effect. In any case, here we are, the Class of 2016. Fifteen worthy artists entered the ballot Thunderdome, just five are left standing. But damn, this is far too many nominees if only five acts get in. For 2017, the Hall should offer up 10-12 nominees maximum. Ditch Chic, forget Sting, stop nominating The Smiths (a proper English bummer, but the voting body isn't checking a box for them at this point) and serve up a ballot with 10 worthy nominees, with the intent of inducting at least six. Janet Jackson, a stunning omission this year, likely would have made the cut if there were six or more. If the five-performer-inductees-only thing is because the ceremonies are excruciatingly long (and, if you're in the room and not watching the HBO edit in May, they are), throw more solo artists into the mix, and/or limit the speech length by playing people off, as they do at the Oscars. And no, don't do that to Paul or Ringo, but if the seventh speaker from the Paul Butterfield Blues Band is going long or, horrors, stepping to the mic to a forehead-slapping second time, nudge them along. If speeches of an enforced length equal another inductee, it's absolutely worth offending an errant windbag or two. Coming in late January, apparently, is the held-back announcement of various "Non-Performer" or "Musical Excellence" honorees. Since the inductee list was low on the surprise meter, the real Rock Hall shocks may come here. Nile Rodgers, Musical Excellence? Heck, even Janet under Musical Excellence? Anything could happen; they folded Ringo Starr in last year under that category and he wasn't even on the ballot. Finally, what is April 8, 2016's end of night all-star jam? "Smoke on the Water" might be a bit obvious, but there are a lot of graying Baby Boomers with guitars in this class that could send that riff into the stratosphere. I credit my wife for the idea of N.W.A. 's "Express Yourself" with Chicago's horn section (brilliant, really). Congratulations, Cheap Trick, Chicago, Deep Purple, N.W.A., and Steve Miller. This club seems to get more exclusive all the time. Yeah I have the sneaking suspicion that they have 5 people to keep the ceremony shorter, which is BS. I know it's not very rock and roll to put limits on people, but it is the Rock Hall's fault for not putting firmer rules around speeches. Anyways, you know my stance, I am over the moon about N.W.A, and the Damone clip is priceless. And also, they need to use my "Express Yourself" idea. Amen. This class should have been six or even (gulp) the maximum seven. Limiting speeches is unfortunate but really the only way to go if we're about honors and not HBO specials.